Today’s customers demand personalized experiences that are delivered to them when they want it, and in the way they want to consume it. To deliver on this expectation, we must create content that shows we have a deep understanding of who our audience is and what their needs are. This requires content that is targeted to a specific persona at a specific moment in their journey state. Delivering the right message to the right person at the right time is key. But how do we ensure that the content we create is delivering the right message? The answer is to perform an audit focused on aligning content with both a specific persona and a journey state. The goal of a content audit is to identify and evaluate your current content and advertising, as well as identify possible gaps in this offering. Though a content audit can determine a number of different outcomes, this post specifically focuses on auditing existing collateral as it relates to persona and customer journey. Why focus on persona and journey state? According to a study by the Content Marketing Institute, 60-70% of content created for the B2B market is never used. A majority of the study respondents said it is because the topic is irrelevant to the buying audience. Think about that for a moment – about ⅔ of the content being created is not being used because it is not relevant. As if that was not reason enough for performing an audit, consider this statistic from DemandGen’s Content Preferences Survey: 95% of buyers chose a vendor that provided content which helped them to move through each stage of the buying process. Consumers want to be educated, and they look to marketers to help light the way as they go down the purchasing path. The first step in giving consumers what they want – relevant, personalized content and advertising – is to inventory our current content. Download our free content audit worksheet and document each piece of content and advertising currently in your arsenal. Once you have a comprehensive list of your collateral, it can be audited and ranked based on its ability to target by persona and customer journey consideration state. To help put this into context, we will give examples for EverClean Floors, a fictional carpet cleaning company targeting residential and commercial customers. Personas provide unique insights into the lives and purchasing behaviors of our target audience. Our ability to create content based on these insights gives us the opportunity to provide targeted content that positions our brand, product or service as the right fit for each persona. But to do this, we must speak to what it is that makes them unique. This is why auditing content based on persona is so important. Auditing content based on a specific persona gives us the opportunity to evaluate how well our content and advertising addresses their needs. To better understand this, let’s look at our carpet cleaning company, EverClean Floors. EverClean has identified two personas: Julie and Margo. Julie is a stay-at-home mother of three very active boys, one of whom has severe asthma. Keeping her house and carpets dust and mite free is important for the health of her family. Margo is a real estate agent. She has been a great referral source for EverClean, referring residential customers who are selling their homes as well as new homeowners. As a referral partner, Margo’s needs are very different from Julie’s. While both personas are important to EverClean’s overall marketing strategy, how they interact and rely on EverClean is very different. And because their overall needs are different, the message that resonates with them will also be different. An additional benefit of auditing content based on persona is that it allows us to prioritize our content needs. Rarely do we have the time or budget to create all of the content that we want to publish. By auditing based on persona we are able to identify the persona “buckets” into which our current content fits, and where future opportunities may arise. We can then prioritize the development of new content based on the strategic objectives of our organization. When reviewing your content, identify which of the five journey consideration states – “See”, “Think”, “Do”, “Grow” and “Give” – your content addresses. Not sure where your content fits? Read on for descriptions and examples of recommended content for each state. The “See” state applies to anyone who is a qualified prospect but is not yet thinking about us or our product(s). While this is the broadest of our audience segments, we know the least about them and they have expressed no interest in us. That lack of interest means we have to work particularly hard to break through the clutter of other competing messages in our prospects’ lives. To do this, our “See” state content must either engage the passive part of their brain or be so relevant to them that it will catch their attention. In each case, the content provided entertainment or utility that was universally valued by an audience comprising more than one persona. While the prospect may not have been actively looking for this content, it was so relevant and useful to them that they paid attention anyway. The “Think” state includes any qualified audience member who is thinking about purchasing your product or service but has not yet made a commitment to buy. 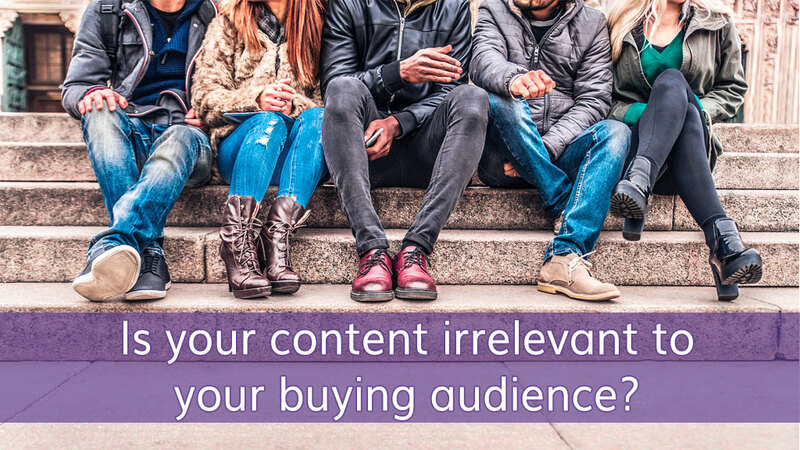 At this stage in the buyer’s journey, the prospect is looking for content that will help them make a decision about your product, service or brand. This content will be more targeted, and more specific, than that which was delivered in the “See” state. Since the prospect has a need that can be fulfilled by your brand, product or service, they are receptive to your message, with one caveat – it must also help them or provides value to them in some way. “Think” state content should be written with a specific persona in mind. While a call to action is typically included, it may not necessarily be there to entice personas to buy. Instead, it may be to learn more, or to request further information. Prospects in the “Do” state are qualified audience members who have decided to purchase our product or service within a specific period of time. Since they are ready to buy, our messaging needs to create a sense of urgency and give them the means to make that purchase. Pretty much anything with a “Buy Now” call to action is going to be classified as “Do” state content. Once a prospect converts to a customer, and is also happy and loyal, they have entered the “Grow” state. The goal of our content and advertising here is to strengthen our relationship with this audience. Often, these messages are delivered through monthly newsletters. The “Give” state audience is so happy and loyal to our company that they will refer friends, family (and in some cases) strangers. This messaging is especially powerful as it provides talking points for when this audience refers us to friends and family. The content will very clearly fit into one of the consideration states outlined above. If this is the case, select the status “Use As Is” in the content audit worksheet. The content does not have a clear journey state, in which case the content will need to be revised in order to fit a specific consideration state. So as not to lose momentum during the review process, mark the status of this content piece to “Modify Existing Content” and then update the “Changes Needed For Alignment” column to reflect the necessary changes. The content fits into multiple consideration states. This presents a unique opportunity to split the content into two (or more) pieces that speak to the needs of one specific state. Change the status of this content piece to “Modify Existing Content” and update the “Changes Needed For Alignment” column accordingly. Once you have filled out the first tab in the Content Audit Worksheet, click on the Analysis tab to see a breakout of your content. As you analyze your content gaps, keep in mind that budget or time constraints may keep you from creating all the content you need at once. 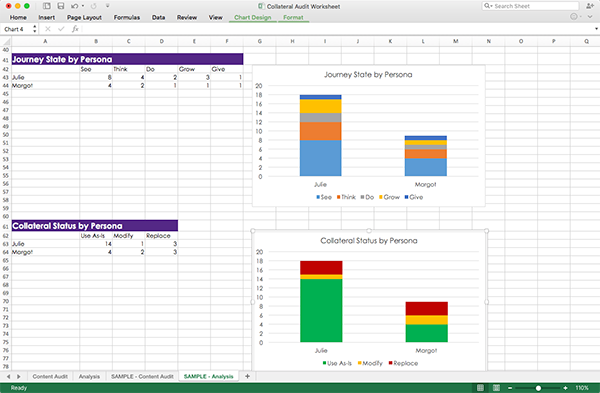 Instead, use the graphs in the Analysis tab to identify the persona or journey state(s) with the biggest content needs, and prioritize accordingly. When we take the time to align our content with both persona and a specific state in their buyer’s journey, we enhance our ability to deliver the right message to the right persona at the right time. The additional time and effort needed to inventory, audit and update content is worth the investment in resources, and will be realized through increased engagement and improved return on investment. For a quick-reference, download our Collateral Audit Worksheet. We help you organize your content by content type, persona and journey state and provide an easy-to-use graphical analysis. The worksheet also includes a sample collateral audit.